Your business can benefit from adopting some of the new marketing strategies on the market today. Periscope, the live streaming platform, is one of them. It’s easy to get started with Periscope and doesn’t have to cost a lot of money. It offers a new type of content that can be used to market your business and interact with your customers. What is Periscope and Why Should You Use It? Periscope is one of the leading live streaming platforms in the world today. It’s one of the most well-known names in this niche, making it an ideal platform to start live streaming on. It comes with a gentle learning curve, allowing you to easily get started without any previous experience. Live streaming is one of the best ways to engage with customers. You can broadcast a live event and allow people to interact with that event at the same time. You can hold live discussions and turn your video content interactive. You’re taking already successful content and turning it into something that’s even better. What could be more beneficial? You need to understand that Periscope is run by Twitter. 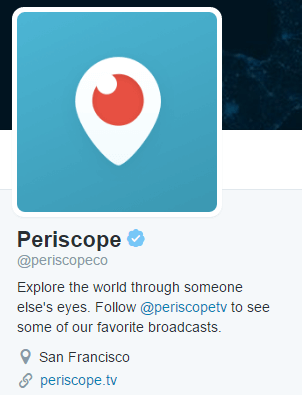 This means you have to have an existing Twitter account before you can create a Periscope account. Your handle on Twitter will be shared on Periscope, so make sure you come up with something memorable. Periscope provides a direct link to the second biggest social media network in the world. It makes sense to populate your account with followers and useful content before you get started with broadcasting. This will allow you to leverage interest in both directions. What Equipment Do You Need to Start Broadcasting? It’s simple. To start with you’ll need a decent camera. Make sure it shoots in HD because people will expect nothing less these days. Apart from that, the only other piece of essential gear is a strong Internet connection. You don’t want your live broadcast to jump and skip along the way. Quality is everything when it comes to your broadcasts. We recommend that you try out private broadcasting before you move into public broadcasting. This will allow you to refine your presentation without embarrassing your business. Remember that mistakes are remembered and you want to minimize them. Practicing first will allow you to work out most of the big errors that can completely ruin your brand’s online reputation. How Should You Choose the Viewers? Stick to your most loyal customers. If you have beta teams for your products you should extend the invitation to them. They’ll already expect there to be errors, so they won’t raise a stink if something goes wrong. Make sure the broadcast is valuable and make sure they’re actually getting something out of it. Take some of their feedback and incorporate it into your future shows. After you think you’re ready to start broadcasting publicly you should make it into a big event. Don’t do a live stream for the sake of doing a live stream. It has to have a point and it should be integrated with the rest of your marketing campaigns. There are two types of broadcast. You can broadcast an actual event, such as a product release or a business conference. You can also broadcast a talk in the same way as you would broadcast a podcast. Each comes with its own set of nuances and challenges. Part of the reason why people use Periscope in the first place is it’s interactive. Leverage this feature as much as you can. For example, you could start with a Q&A session. Take questions from the Periscope audience. This will allow customers to feel as if they’re really part of what’s going on in front of them. It’s an easy way to keep people watching. It’s only natural to be scared of making some major mistakes. But there’s no getting away from the fact that mistakes are common and you’re not going to avoid them. Making a mistake isn’t going to cripple your company and they’re only going to help you get better at what you do. Learn to laugh about them and pledge to do better going forward. Affordable, reliable and fast KVM Cloud Servers from KnownHost. Periscope is relatively easy to get to grips with. The main challenge is in coming up with broadcasts that people want to watch. Once you get this you’re going to have no problems with engaging people on a regular basis and making live streaming a regular part of your content marketing campaign. How are you going to make sure that Periscope turns your business into a resounding success? With 24/7/365 support, why wait to get one of KnownHost’s shared cloud hosting plans? No Budget to Manage Your PR? No Problem! Simple Ways to Create Your Own PR Strategy!